BAT HOUSE ATTRACTANT - Made in the USA, Hello Bat! is a field-tested bat box attractant spray lure, which is grounded in the bat community's latest pheromone or aromatics' scent research. 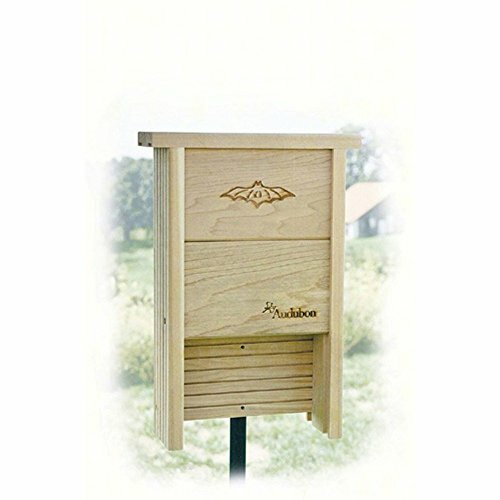 For use with all types of bat houses for outdoors (e.g., belfry, telescoping nesting boxes, 1, 2, 3, 4 (one, two, three, single, double, triple) chamber bat houses plans, large or small bat boxes, best selling bat box kit or better kits, cedar trees, looker products, bci or obc system, victorian, weathervane. BAT CONSERVATION - Using eco-friendly Hello Bat! to attract or bait bats to your yard is environmentally responsible compared to the use of bat droppings (i.e., guano, poop pheremone fertilizer, quantities of urine sent, or barn owl farm droppings)-which may spread bat diseases-or toxic, ammonia-based roost-ing attractants or mesh. Also use with wooden bathouses feeders model or bathouse poles! BATS FOR KIDS - Attracting bats to your batt box shelter is a great educational experience for children outside. 100% MONEY-BACK GUARANTEE - Hello Bat! is backed by our 100% sale guarantee that you are fully satisfied with your product or receive your money back from our organization. We are so certain that this bat house attractant will serve you well that we offer a 60 day no-questions-asked refund policy. Start Attracting Bats to your Bat House! With some bat houses, it can be difficult to attract bats to it. 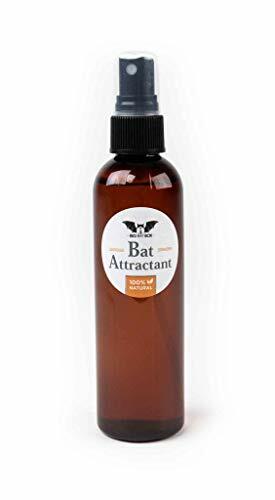 This 2 ounce spray bottle of bat attractant (Simple and Informative Instructions Included!) will increase the chances of bats living in your bat house! Why Bats are so Important! The average bat eats approx. 7000 insects each night. The majority of these will be mosquitos. Mosquitos carry many diseases and are very irritating. The more bats in an area, the fewer mosquitos there will be. Applying Bat Attractant: Shake bottle well before use. Apply five sprays of bat attractant to the lower entrance of your bat house each month until bats arrive. Material of Bat Houses: Non-scented materials like pine are best for bat houses. Cedar and other scented materials will need to air out for several months or years before bats will consider moving in. Storage of Bat Attractant: Store bat attractant in a cool, dry place. Do not freeze. Do not ingest. Avoid contact with bat attractant. Wash hands thoroughly with soap and water after use. Keep away from children and pets. May stain clothing and surfaces. Finally Start Attracting Bats to your Bat House! 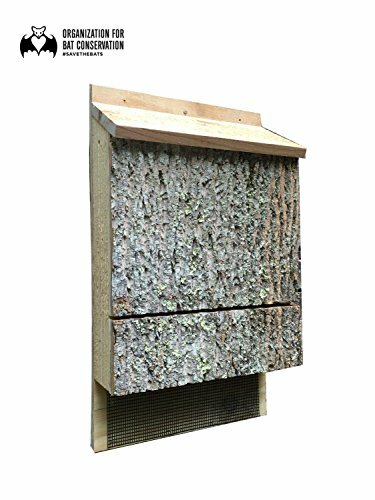 Works with Any Variety of Bat House or Bat Box! This Bat Attract Spray will Increase the Chances of Bats Living in your Bat House! The Average Bat Eats Thousands of Mosquitoes Every Night. Mosquitoes Can Carry Disease and Be Very Irritating. The More Bats you have in your Area, the Fewer Annoying Mosquitoes you will have! This Bat Attractant is Easy to apply to your Bat House! Simple instructions are Included! Install this Wood Link Bat Shelter to provide a safe haven in your backyard. Made of natural cedar, this shelter can house up to 20 bats. Dimensions: 12W x 4.25D x 17.5H in.. Constructed from cedar wood. Natural wood finish. Intended for bats. Mounted on a post. Bat capacity of 20. Dimensions: 12W x 4.25D x 17.5H in. 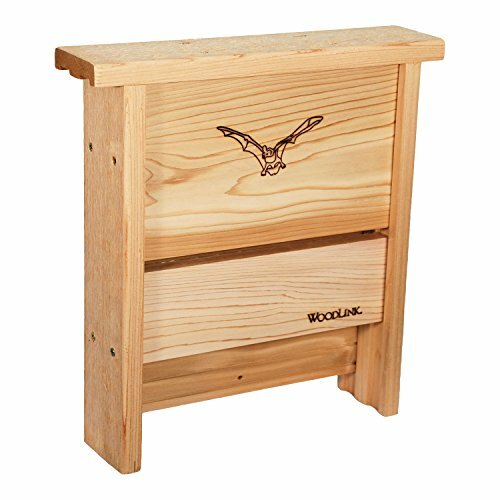 Woodlink cedar bat Shelter is ornithological correct and specifically designed to attract bats. It features natural inland cedar and is constructed with screws, not nails. Mount on tree or eave of building with included hardware. Made in USA. 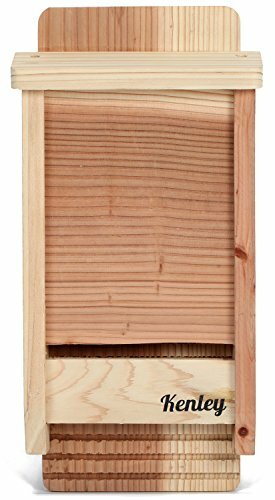 -OBC ENDORSED-Our large triple chamber bat house is endorsed by the OBC as a safe, properly spaced, and effective bat nesting house. A percentage of each sale goes directly to the OBC. -HANDMADE USING TOP GRADE MATERIALS-Made with reclaimed tree bark, rust proof exterior screws, eastern hemlock, and exterior grade plywood. All joints glued with non toxic waterproof glue to eliminate drafts and create a waterproof dry interior. -DESIGNED TO WORK-Interior chamber and landing platforms are fitted with polyethylene mesh secured with monel rustproof staples as to ensure years of proper use even in harsh outdoor conditions, and stand strong even when exposed to bat urines naturally corrosive nature. -PROPER SIZE AND DESIGN-Our large triple chamber bat house meets all OBC requirements for space and size, as to provide the proper sized nesting area for up to 300 bats. 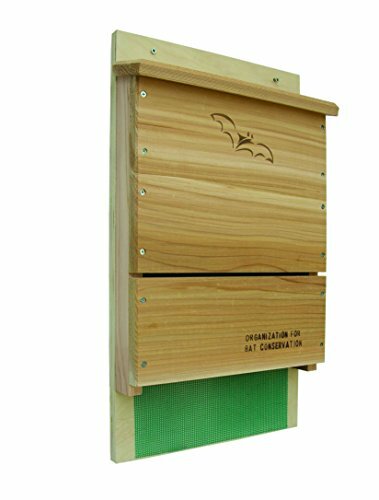 -80% MORE EFFECTIVE THAN NON OBC BAT HOUSES-The OBC endorsed bat houses can have an 80% or greater occupancy rate as compared to 10% with some other designs. -TREE BARK IS ETHICALLY SOURCED PREVIOUS WASTE PRODUCT-The tree bark used in the construction of our large triple chamber bat house was a previous waste product of the lumber industry. The bark is now saved from waste, and used to create our incredible bat nesting home. All bark is kiln dried as to kill all evasive pests, making our triple chamber bat houses perfect for shipping across the country or the globe. -OBC ENDORSED-Our single chamber bat house is endorsed by the OBC as a safe, properly spaced, and effective bat nesting house. A percentage of each sale goes directly to the OBC. -HANDMADE USING TOP GRADE MATERIALS-Made with reclaimed tree bark, rust proof exterior screws, eastern hemlock, and exterior grade plywood. -PROPER SIZE AND DESIGN-Our single chamber bat house meets all OBC requirements for space and size. As to provide the proper sized nesting area for up to 100 bats. Extended 6 in nylon mesh landing area for easy entrance. The durable Poly Wood bat house will last for years. The night blooming Four O'clock and Evening Primrose flowers are known for their alluring scents that draw insects when bats feed. DESIGN: The dimensions are 15 in x9 in x 2 in. It has a nylon mesh, 6 in, landing area. Sturdy hanger hook allows easy mounting to a pole, tree or wall. Poly Wood is naturally weather proof and resistant to rot/splitting. 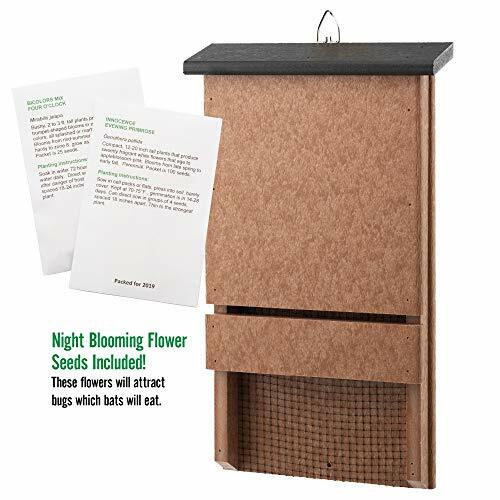 POPULAR WITH BATS: When the bat house is installed and the night blooming flower seeds planted nearby, there is a better chance of alluring bats. Specifically picked, Four O'clock and Evening Primrose, seeds produce night blooming scented flowers that attract insects when bats feed. EASY TO INSTALL: This bat house is shipped pre-assembled. Mount bat house about 12-14 feet high away from any tree branches, facing south or southeast. HANDMADE: Crafted one at a time, made from Poly Wood (recycled plastic) in the USA by experienced Amish carpenters. The best made bat house you will ever purchase. 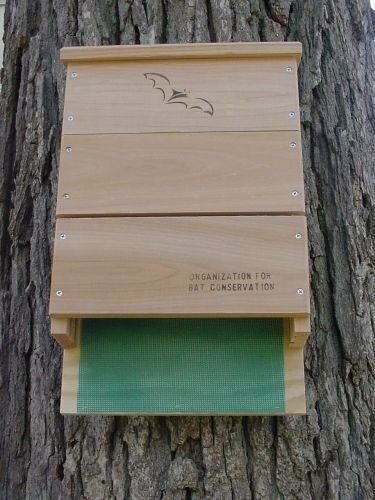 The OBC Single-Celled Bat House features a single chamber that holds up to 100 bats. This house was designed by the Organization for Bat Conservation based on the results of more than 10 years of diligent research. Bat houses such as this tend to have higher occupancy rates than the smaller houses. The interior surface and landing platform is made of rough wood covered with green colored screening to make it easy for bats to cling when roosting and landing. The single chamber measures 1 1/2" deep with a 3/4" entry gap. The 1/4" ventilation gap in the front of the house serves to maintain proper temperature and helps with air circulation. A 5" bat design is burnt into the front of the house. The roof is slanted forward for better rain run-off. 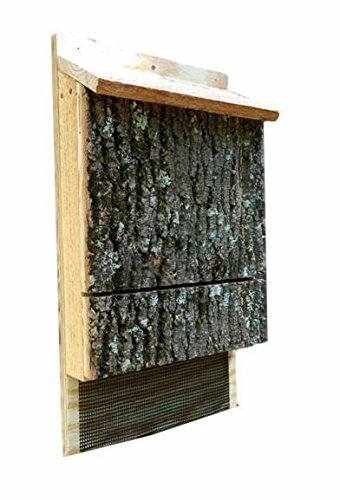 This bat house weathers beautifully as it is made of weather-resistant inland red cedar on a 3/4" exterior grade plywood back and is assembled with galvanized screws. Hand made in the USA. 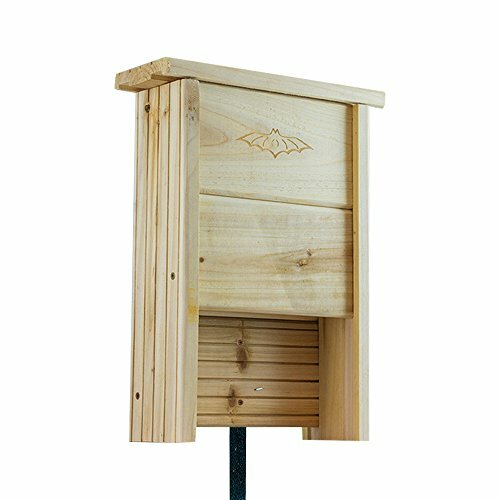 A portion of the proceeds from this bat house go back into bat conservation, public education, and ecological research. Made of weather-resistant cedar and 3/4 inch exterior grade plywood while nylon mesh lined interior allows bats to maneuver around inside. Worldwide, 77 species of bats are endangered and in many countries (including the US) loss of habitat means all local bats are at risk. Installing a bat box is a great way to support these beautiful animals - and also cut down on the number of mosquitoes and flies in your area! The Kenley Bat Shelter is designed to host a small bat colony. It's hand crafted from premium cedar wood and varnished to make it weatherproof. It can be painted or sprayed to change the colour. The Kenley Bat Shelter comes with a mounting hook at the back and information about bat preferences. Bats fly to their roosts, so the house should be at least 12 feet above the ground. Choose a spot that's sheltered from the wind yet gets direct sunlight for 4 or more hours a day. Please bear in mind that installing a bat house does not guarantee you'll see bats. Bats are wild animals and it may take several months for local bats to discover your bat house. Never disturb roosting bats. DESIGNED FOR BATS This Kenley bat house has been developed using available research on bat preferences and needs. The specially engineered interior and exterior perches make it easy for bats to land and roost. This single chamber bat box external dimensions are 14.6"x6.7"x2.2". POPULAR WITH BATS The Kenley bat house has an interior which forms a grooved and well-spaced inside roosting area. In addition, it has a rough platform and skerfs to make landing easy. Worldwide, 77 species of bats are endangered and in many countries (including the US) loss of habitat means all local bats are at risk. Installing a bat box is a great way to support these beautiful animals - and also cut down on the number of mosquitoes and flies in your area! The Kenley Bat Shelter is designed to host a small bat colony. It's hand crafted from premium cedar wood and varnished to make it weatherproof. It can be additionally painted or sprayed to change the colour. DESIGNED FOR BATS This Kenley bat house has been developed using available research on bat preferences and needs. The specially engineered interior and exterior perches make it easy for bats to land and roost. 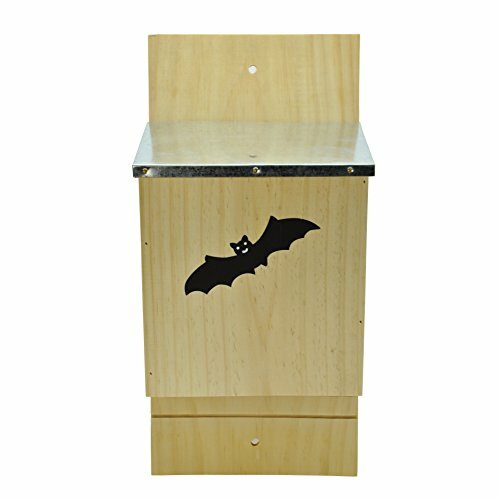 It is a large bat box with two chambers, the external dimensions are 15"x9.2"x3.2". 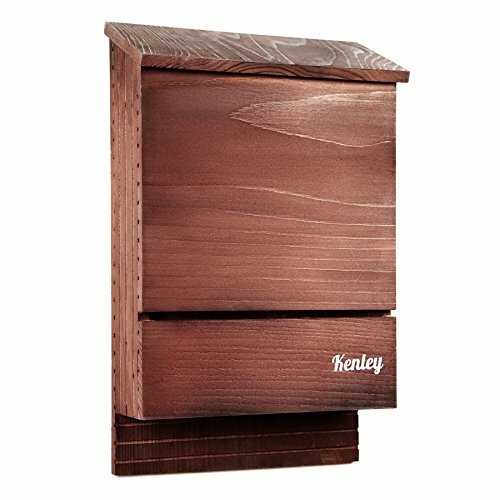 NATURALLY WEATHERPROOF Handcrafted from high-quality cedar wood, this Kenley bat house will keep rain and snow out, and will last years as cedar is naturally resistant to rot and decay. It's also stained a dark color, as bats associate this with warmth (in cold climates) and privacy. POPULAR WITH BATS When installed in bat territory, the Kenley bat shelter has an 80% chance of being occupied. This is far higher than single-room models. The Kenley bat house has a 2-room interior which forms a grooved and well-spaced inside roosting area. In addition, it has a rough platform and skerfs to make landing easy. Basically, from the bats point of view, a bat house should be warm, dry, easy to enter or exit (no clutter), and safe from predators. Bats may find bat houses more quickly if they are located along forest or water edges where bats tend to fly. However, they should be placed at least 20 to 25 feet from the nearest tree branches, wires or other potential perches for aerial predators. mounted on a pole or the side of a structure. minimum of 15ft, above the ground. open uncluttered sites that receive 6 or more hours of direct sunlight / day. a southerly orientation. Bat houses mounted in back to back pairs should have a SE - NW orientation. DO NOT mount your bat house on the trunk of a tree. However, bat houses can be hung from the limb of a large shade tree, if no open areas are available. Avoid orienting a lone bat house directly North - it will remain too cool. Don't install the house in a shady wooded area. Please trim any tree limbs that grow close to or shade the bat house. Can house up to several bats. Roof covered with iron sheet protector, against rainy days. Grooves cut into the inner chamber to provide secure gripping for the bats. Dimension: 7-1/2-inch in length, 6-inch in width, 15-3/4-inch in height. Bats are one of the most grossly misjudged living creatures on Earth. Despite being a relative to human beings and offering immense benefits, too many people see bats as nothing more than a terrifying rabid, blood-sucking flying mouse monster. Untrue! Facts are, out of the 30,000 annual deaths worldwide from rabies, 99% are from contact with dogs. There are species of bats found in every continent except Antarctica. Commonly found in caverns, hollow trees, under loose tree bark, and man-made structures like barns, bridges, older buildings, mines, and wells. But what can we do to help? A great way to start is by providing bats with a safe sanctuary to roost and nurse their little pups, while avoiding predators, fungi, and other dangers. It is very simple, really. Each Houseables bat house shelter is premade from rough, unfinished fir wood. It comes pre-drilled for simple mounting. Measuring 16" x 4 " x 12", this bat house is sizeable enough to fit up to 20 bats at a time. The quality fir wood construction will sustain itself through harsh weather environments, long-term bat residency, and invasion from squirrels and woodpeckers. The best location to mount your bat house is 10-15 feet high underneath the eaves of an old building or a barn gable. Make sure you select a spot that has plenty of direct sunshine and a nearby water source (which is crucial, as the mother bat will not have to leave her young unattended for too long). Poles and old or dying trees are satisfactory mounting spots but be mindful that bats are less attracted to shelters mounted on trees. Reasons for this are: it's too easy for predators to get at the bats as they exit, the branches cause obstructions to exiting bats which drop down then up into flight, and it's too shady from the branches above. YOUR VERY OWN BAT SANCTUARY: With a dimension of 16" x 4 " x 12", an interior surface and landing platform constructed from rough fir wood, and grooved for better clinging while bats land and roost. The high quality fir wood can sustain long-term bat occupancy as well as harsh weather elements without warping, cracking, or prematurely aging. CHOOSE YOUR LOCATION CAREFULLY: Included with each house are zinc plated deck screws and predrilled holes for easy mounting. Mount the bat house 10-15 feet high (high enough to keep predators away) underneath the eaves of a barn, old building, pole, or a dying tree. You will want to choose a location that offers plenty of direct sunlight and a nearby water source. A single chamber will effectively contain up to 20 bats when properly mounted. BATS PREFER DARKER COLORS: This bat sanctuary is unpainted. Painting or staining your house black or a dark shade of brown with a nontoxic, water-based outdoor paint is recommended, based on your geographical location. Doing so will increase the temperature inside the house, making it more desirable to bats for occupancy. CUT THE WAIT TIME: Ways to encourage bats to move into your bat house include spraying the house with bat attractant oil, filling the bottom of the box with damp soil for a few days before mounting, or by sprinkling small amounts of bat droppings from a nearby colony onto the base. All of these methods may help eliminate human scent that sometimes prevents colonization. Be advised that it can take up to a year for bats to colonize. 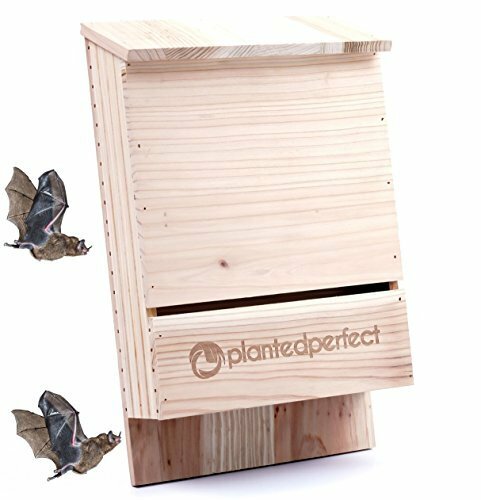 A SAFE HOME FOR YOUR PALS: Our bat house kit will house your bats in a highly-protected environment. Its reliable build will remain sturdy as the bats come to and from their amazing new home. Bats are partial to natural settings close to water. Neighborhoods with mature trees and ground are ideal settings. Southerly exposure 10-20 feet high with sunny exposures are best locations. Enjoy your beautiful bat nursery and the peacefulness of mosquito- free nights. The North States bat house nursery is an attractive, Gray, Cedar wood nursery that can hold up to 300 brown bats. Measures 6.5 x 12 x 18.25 in Height, this bat house contains four cozy roosting chambers and landing skerfs at the base for bats to grip when landing. 3 pre-drilled holes on the back for mounting to poles, trees, house, etc. Quality Cedar wood is naturally rot resistant, the light Gray color will help maintain an ideal temperature for bats, while the air vents allow for proper ventilation. Brown bats can eat 1000 mosquitoes in one hour. More fun bat facts included. -100% Satisfaction Guaranteed or your money back no questions asked. We Love Batman - Bats Too! First, take wet soil and fill the base of the box. Then, a few days later, take out the soil and set up the box. Try to use real bat droppings if you can get them. That way you will rid of the human scent that could stop the bats from moving to your shelter. Perfect choice any bats. Whether it's Mexican bats, Brown bats, Cave, Yuma or northern long-eared bats, you will see a new colony inhabiting your shelter in no time. With a textured interior surface that provides a fine grip and well-placed holes for mounting, your new flying pets won't ever want to move out. We want to help you set up the best bat home around. But we know it is not easy to know beforehand if a product will completely suit your needs. So rest easy - if you are not 100% satisfied with your bat house, simply return it and get your money back, no questions asked. There is no risk involved, only quality and care. Let us help attract bats to your home. Get your bat house today and get rid of mosquitoes!. BONUS! Free For a Limited Time ORDER NOW and get our entire EBOOK BUNDLE Great Grass, Starting a Veggie Garden, Roses and More.. 84 pages to inevitable yard envy - yours FREE! POWERFUL MOSQUITO REPELLENT - Forget about annoying pests. The bats eat them ALL. Enjoy your newly reclaimed yard thanks to your new bat house. STURDY AND DURABLE - No cheap parts, no compromises. Just a 209 in3 solid homemade, handcrafted firwood construction that lasts for years, holding up to 360 Freetail bats at a time. NOTE: Based on scientific data in our experience it holds less. Still, several 100 bats eat a ton of skeeters! EASY PLACEMENT - Simple instructions and hardware included - A quick coat of stain and you'll have it up in your yard within an hour. Includes detailed staining instructions to attract bats. To attach, just screw it into house or tree, no assembly required. NOTE: Staining interior not required. Warranty: 100% MONEY BACK GUARANTEE - Love your bat house or your money back, no questions asked. 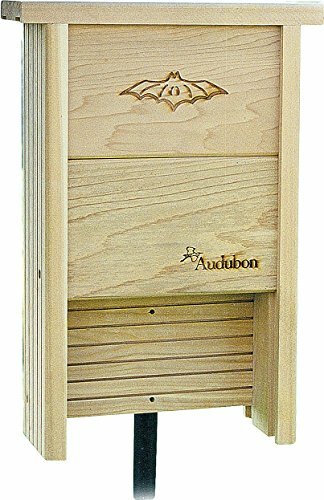 Give the bats in your backyard a place to roost using the Audubon Cedar Bat Shelter. With a single chamber large enough for 20 bats, this bat shelter is perfect for your small backyard colony. The interior surface and landing platform are made of rough cedar and are grooved for clinging when roosting and landing . Mount this bat shelter 8 feet to 12 feet high in a tree or under the eave of a building. Can also be placed near ponds, lakes or streams facing the sun. 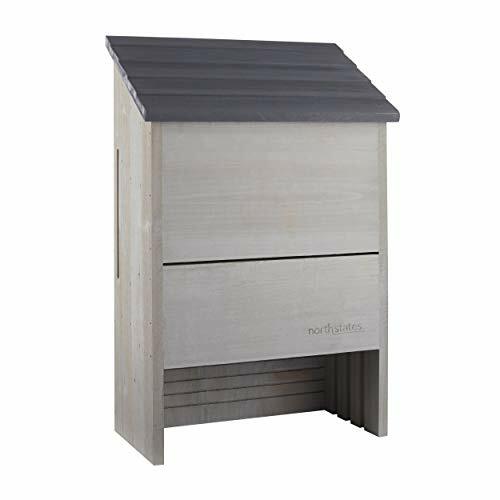 The shelter is perfect for your small backyard colony; for use by big brown, cave, eastern pipistrelle, evening, little brown, mexican free-tailed, northern long-eared, pallid, pallas' mastiff, rafinesque's big-eared, southeastern, and yuma bats.